Through HCL's capabilities, knowledge & assets, enterprises are able to bring about efficiency in infrastructure, increase asset life, reduce capex, and free-up locked human resources to support transformation projects. We help you design an infrastructure that promptly reacts to any change, integrates legacy and new architectures to make a unified manageable environment. Availability of VTP Cloud for all the 365 days including weekends. - 24/7 support with online Ticketing system / SMS / Telephone / email. - Equipped with secured, stable 2:2 Dedicated leased circuit. - Equipped with higher configurations of Dell Servers & Storage with standby equipments. Complete, modular physical infrastructure solution above 1 MW that is fast and easy to configure, deploy and operate. Data Center Management services enables Corporate to focus on their core business by taking over the management of their data center operations. Maples Imaging Solution Pvt. 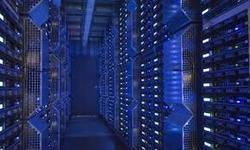 Ltd.
Data Center Management - Data Center Management services enables Corporate to focus on their core business by taking over the management of their data center operations.